651x366 September 11 2014. September 11 2014. The scenario of prolonged repression and the memory of October 1 make this Eleventh of September absolutely exceptional. We are convinced that, far from the will of those who would like us to give up, on Tuesday we will see a day of collective vindication, dignity, and self-esteem, united in plurality, as we have always done in Catalonia’s great national mobilizations. We plan to fill the streets of Barcelona once again in an exercise of peaceful and broad-based determination. Despite repression, exile, and imprisonment, we are aware that it is time to strengthen the great consensus of our nation and, as we have always done, strengthen the feeling of shared belonging, without falling into the trap of any sterile provocation by those who want to see us split down the middle and at loggerheads with one another. We feel ourselves to be the heirs of the anti-Franco fighters and the legacy of Catalanism, Catalan sovereignty, and the pro-independence movement, who have always worked to enrich Catalonia’s collective imaginary, based on empathy, and without excluding anyone on grounds of their place of birth, language, or identity. And it is thanks to this effort that we presented a united, exemplary response to the court ruling that watered down our Statute, we rallied against war and in defense of our territory; we unanimously cried that "We want to welcome [refugees]" and we condemned terrorism. And, especially, in the face of the unwarranted violence by Spain’s security forces during the referendum on self-determination on October 1. We call for freedom, because its deterioration is now very visible in Spain. Thousands of people are victims of the "gag law", and many others are seeing our rights and liberties seriously curtailed due to politicized actions that do not respect individual rights by officials who command the police forces, the prosecutor's office, and the courts themselves. We defend freedom without limits as a guarantee of social cohesion in Europe, as well. To defend our liberty in Catalonia today is also to do so in Madrid, Paris, Rome, Berlin, Prague, and Istanbul. We call for justice, because we have committed no crime and we will fight for our freedom so all the exiled and those held in prison can return home. While Europe is unequivocally clear in its rulings on justice, some members of the Spanish judiciary are obsessed with an unhinged crusade that does not hold water when tested by the justice systems of countries such as Germany, Scotland, Switzerland or Belgium. An non-guilty verdict is the only answer we expect. We demand democracy, because we have always wanted to do as Scotland did, and today we also want to reiterate our commitment to dialogue, as we have always done. We seek a dialogue that must be sincere, honest, open, and without limits, where we can talk about everything in the framework of peaceful coexistence and mutual respect. And, although it is true that we do not rule out anything as long as it is peaceful and democratic, any proposal by the government of Pedro Sánchez must respect the majority will of the people of Catalonia. We support the Catalan Republic, as a legitimate and democratic expression of the will of many voiced so often in the streets and at the polls in favor of rights and liberties, that connect us with a fairer, more sensitive, and more tolerant, more cultured, and modern world that faces challenges with the complicity of all its fellow citizens and which will always turn its back on intransigence and violence. They are rights and freedoms that we are convinced will be guaranteed in a democratic Republic for everyone. Despite the walls or the kilometers separating us, we speak to you from a place of serenity and determination. 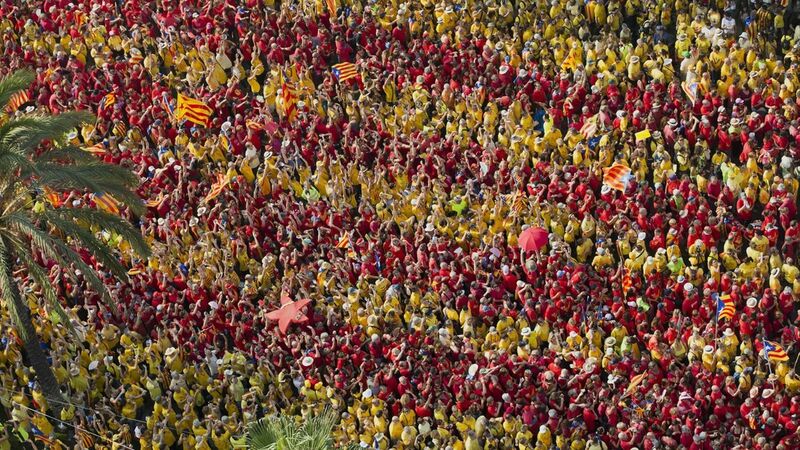 We trust the spirit of dignity and courage of every Diada and the trust in us that every one of you has shown at all times, as you have done since we were detained or went into exile. Today, we once again reaffirm our commitment to convince rather than vanquish, to build rather than fracture, to reason rather than impose. As Manuel de Pedrolo once said: "Between intransigence and weakness, flexibility". We will not sell ourselves short and, in our case, we will strive to find a way to make the Republic democratically effective, the Republic that was defended in a dignified, peaceful, civic way on October 1. We act with the tranquility of knowing that we are doing all of this together and that we will never leave anyone behind, and that these two conditions will bring us the full freedom of all the citizens of this nation, regardless of where they were born or where they come from. The Diagonal is a broad avenue where there is room for all. Because the rights that we claim belong to everyone and because the difference is the necessary condition we have, as a society, to advance democratically. We call on trade unions, employers' associations, professional boards, third sector entities, and the whole of Catalan society to become involved in the defense of universal rights and freedoms. Those that we had to win in the streets, challenging the Franco regime, which helped our communities grow and contributed to prosperity, and that we have demanded without fear every time injustice has appeared in some corner of the world. As well as in Catalonia. This September Eleventh we will fill Barcelona with freedom, justice, democracy and republic. Thank you for always being there and for persevering. We will not fail.